Big Brother Gossip: Big Brother Gossip On Kindle. This past holiday season we got a Kindle. Pretty cool little device. 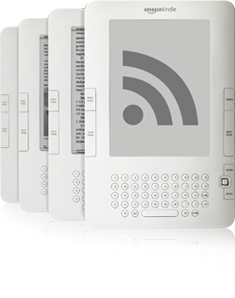 Then I discovered that amazon is allowing blog publishers to put their blogs on Kindle. I thought I'd give it a shot. So its up there now. Yes you can now get this wonderful blog delivered via Kindle. Will anyone want that? I haven't a clue. The price is set at $1.99 a month which I had absolutely no control over - I frankly I was hoping for a quarter a month or even free - but Amazon seems to set the price. As anyone that visits this site knows, it is a ghost town around here for 2/3 of the year - but when July comes around things will be hopping. You can get a free 14 day trial - so check it out if you have a kindle. Even if you don't have the actual device there is a kindle app for iphones, blackberries and even PCs. Then again - if you have one of those you may as well just come to bigbrothergossip.com anyways right? I'll be interested to see if anyone signs up. I'll even post an update to tell you all if it was a success or failure later on. By the way - here is the amazon page to subscribe if you are so inclined!